For an instant room makeover just add pillows. Pillows are like jewelry - they're an added accessory to make a rather dull and plain room come alive with prints and colors. Pillows can be a welcome accessory in any room in the house. Using a pillow pattern you can easily sew your own pillows. Learn how to sew beautiful scented pillows, a ring bearer pillow, restful neck pillows and other pillows using the following patterns. 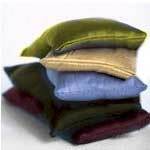 Choose from 15 different pillow patterns, including sports and ruffled pillows. This pillow is designed for neck support and its simple to make too. 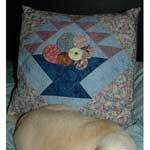 Drag out your quilt blocks and use them to make throw pillows. 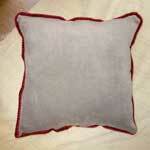 This article will show you how to make a basic square or rectangular pillow. Use high-quality materials for this pillow and be creative. 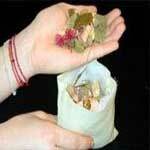 Heated & scented neck pillows can give relief to sore, aching muscles while soothing the soul. 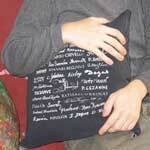 These pillows make wonderful stocking stuffers and hostess gifts. 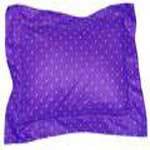 This pillow blocks out the light and spreads a soothing gentle weight over and around your eyes. Decorative pillows are the perfect way to add a personal touch to any room. 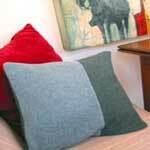 Make some great looking pillows by using your old favorite wool sweaters. Is your favorite shirt getting worn out? Make this easy cover for a throw pillow. 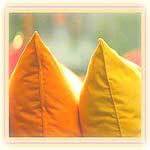 Decorator pillows provide lively spots of color, texture, and pattern. 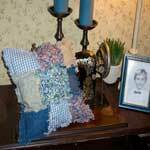 This charming country raggedy 9 patch pillow is quick and easy to make. 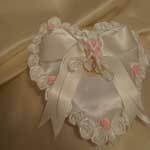 Find step by step instructions on how to sew a lovely corded trim pillow.